Ever seen those U.S. Army commercials where the soldiers vault off buildings and free rappel hundreds of feet from helicopters? Yep, that's the sheer adrenaline rush that you're going to feel on this tour! From our glass-bottomed gondola suspended 300 feet in the air, you'll launch yourself backward, and free rappel back down to earth. 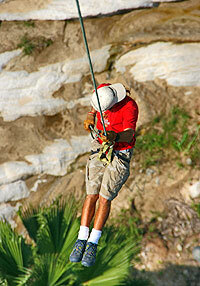 You won't have to do it alone though, because our rappelling setup allows two people to rappel at once! You can take the leap of faith with your friends or family - oh, the stories you'll have to tell back home! This extreme sports rappelling activity takes place at Wild Canyon Ekopark, home of the Fying Tortuga Monster Zip Lines and exhilarating Bungee Jump. Because they're all three at the same place, you can really rev up your pulse by doing all three! After you've had enough excitement for one day, you can relax and share photos and stories at the onsite Lion's Den restaurant. An awesome experience! 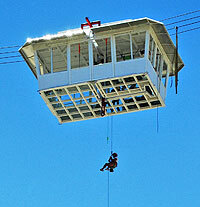 Extreme Combos: Add Bungee Jumping, Sling Swing, Green Zebra or Zip Lines at a discount! Click Here! Three times daily at 9:00 AM, 10:30 AM (Cruise Passengers Only), 12:00 PM and 3:00 PM. Complimentary Pickup and Dropoff at Your Hotel, the Cruise Pier in Cabo San Lucas (10:30 AM time slot only) or at the tour office on the marina. Hotel Pickup and Dropoff (in most cases), Expert Bilingual Guides, Safety Briefing, Gondola Ride Tour, Rappelling Equipment, Water. Weight Limit is 240 lbs. For safety reasons, people with a history of respiratory or cardiac problems and pregnant women are not permitted on the tour. Guests must be able to walk in mountainous terrain for up to 15 minutes. Your cruise ship doesn't offer this, but you can book it here! If you have an observer, please specify in the "special instructions" box when booking. $20 per person charge is paid in cash on the day of the tour.